"Neutral Strip" redirects here. For the area in Louisiana known as the Sabine Free State or Neutral Strip, see Neutral Ground (Louisiana). The Oklahoma Panhandle is the extreme northwestern region of the U.S. state of Oklahoma, consisting of Cimarron County, Texas County and Beaver County, from west to east. As with other salients in the United States, its name comes from the similarity of its shape to the handle of a pan. The three-county Oklahoma Panhandle region had a population of 28,751 at the 2010 U.S. Census, representing 0.77% of the state's population. This is a decrease in total population of 1.2%, a loss of 361 people, from the 2000 U.S. Census. The area also includes Beaver Dunes State Park with sand dunes along the Beaver River and Optima Lake, the home of the Optima National Wildlife Refuge. Map of Oklahoma Territory, Indian Territory and the "neutral strip"
Shortly before the arrival of European and African explorers,  the panhandle was home to Southern Plains villagers. From 1200 to 1500 CE, the semi-sedentary Panhandle culture peoples, including the Antelope Creek Phase,  lived in the region in large, stone-slab and plaster houses in villages or individual homesteads. As horticulturalists, they farmed maize and indigenous crops from the Eastern Agricultural Complex. Several Antelope Phase sites were founded near present-day Guymon, Oklahoma, including the McGrath, Stamper and Two Sisters sites. The arrival of horses from Spain in the 16th century, allowed American Indian tribes to increase their hunting ranges. These Southern Plains villagers became the Wichita and Affiliated Tribes. The Panhandle was the part of Oklahoma that was most adversely affected by the drought of the 1930s. The drought began in 1932 and created massive dust storms. By 1935, the area was widely known as the Dust Bowl. The dust storms were largely a result of poor farming techniques and a plow-up of the native grasses that held the fine soil in place. Despite government efforts to implement conservation measures and change the basic farming methods of the region, the Dust Bowl persisted for nearly a decade. It contributed significantly to the length of the Great Depression in the United States. Each of the three counties experienced a major loss of population during the 1930s. As of the 2000 census, 7.7% of the population was under the age of five, and 12.5% of the population exceeded 65 years of age. Of the population under the age of 5, 54.95% were non-Hispanic white, 41.12% were Hispanic of any race, and 0.80% were African American alone. Of the population 65 years of age and over, 95.29% were non-Hispanic white, 3.52% were Hispanic, and 0.03% was African American. Of the non-Hispanic white population, 16.45% were 65 years of age or older. As of the 1990 census, 89.40% of the population was non-Hispanic White, 9.11% were of Hispanic of any race, and 0.27% were African American. 6.72% of the population was under 5 years of age, and 14.7% were 65 years of age or older. The median income for a household in the region was $34,404, and the median income for a family was $40,006. Males had a median income of $27,444 versus $19,559 for females. The per capita income for the region was $16,447. ^ Richter, Sara and Tom Lewis. "Cimarron Territory," Encyclopedia of Oklahoma History and Culture, Oklahoma Historical Society, Accessed July 1, 2015. ^ "Oklahoma Geography from NETSTATE". www.netstate.com. ^ Leland Bement, "Beaver River Complex Contribution to Folsom Archaeology: An Update and Future Directions," The Digital Archaeological Record (2015). ^ "African Explorers of Spanish America". Park Ethnography Program. US National Park Service. Retrieved 13 April 2015. ^ a b Lintz, Christopher. "Antelope Creek Phase". Texas State Historical Association. Retrieved 17 March 2015. ^ Map of the Santa Fe Trail. Retrieved February 14, 2015. ^ "Oklahoma Panhandle: Badmen in No Man's Land". Wild West magazine. 2006-06-12. Retrieved 2012-11-30. ^ a b c Turner, Kenneth R. "No Man's Land". Encyclopedia of Oklahoma History and Culture. Oklahoma Historical Society. Retrieved 2012-11-30. ^ a b c Sara Richter and Tom Lewis, "Cimarron Territory", Encyclopedia of Oklahoma History and Culture. Accessed April 13, 2013. ^ a b Wardell, p. 83. ^ a b c "Beaver County – No Man's Land". Annual Reports of the Department of the Interior for the Fiscal Year Ended June 30, 1904. U.S. Department of the Interior. 1904. pp. 463–465. Retrieved November 30, 2012. 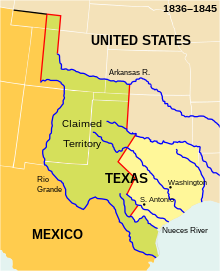 ^ "Cimarron: Concept of Panhandle state nixed by political squabbling". 4 November 2015. ^ Library of Congress. "America's Story from America's Library: The Dust Bowl of Oklahoma." Retrieved July 30, 2013. ^ Goins, Charles Robert and Danney Goble. "The Oklahoma Panhandle, 2000." In: Historical Atlas of Oklahoma. Available on Google Books.p. 206. Retrieved January 19. 2014. Beck, T.E. " Cimarron Territory," Chronicles of Oklahoma 7:2 (June 1929) 168–169 (retrieved August 16, 2006). Wardell, Morris L. "The History of No-Man's Land, or Old Beaver County", Chronicles of Oklahoma 1:1 (January 1921) 60–89 (retrieved August 16, 2006). Christman, Harry E. (editor-original manuscript by Jim Herron). Fifty Years on the Owl Hoot Trail: The First Sheriff of No Man's Land, Oklahoma Territory. Sage Books: Chicago, 1969. Wikimedia Commons has media related to Oklahoma Panhandle.